All Wentzville, MO Area Residents: Please support LINC, a non-profit organization located in Wentzville. It is easy! Chick-fil-A will donate a portion of sales to customers who mention LINC’s name when placing their orders on March 8, 2018. This includes both inside dining and the drive-through…and is for this one day only at the Wentzville location at 1918 Wentzville Parkway. Order anything off the Chick-Fil-A menu from between the hours of 6 am and 10 pm and remember to mention LINC when placing your order. It’s that easy! Thank you for your support. On December 12-14, First Baptist Wentzville and the HOPE Food Pantry partnered with LINC for their annual Christmas Store. Individuals, retail stores, churches, Toys For Tots and community groups donated new unwrapped toys for boys and girls ranging in ages of birth to 18 years. Their generosity is much appreciated. has selected H.O.P.E. 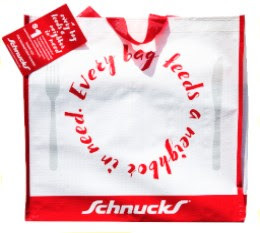 Ministries Food Pantry located at LINC in Wentzville as the February recipient of the Schnucks – Bags 4 My Cause program featuring the “Hunger” bag! For every “Hunger” bag sold during the month of February at this location, HOPE Ministries Food Pantry will receive a $1 donation. Please support this cause. If it is predicted to be 20 degrees or below overnight (via weather.com) and you want to come inside for the night, call the Hotline Number at 636-395-0492.